The EL7041 EtherCAT Terminal is intended for Stepper Motors with medium performance range. The PWM output stages cover a wide range of voltages and currents. 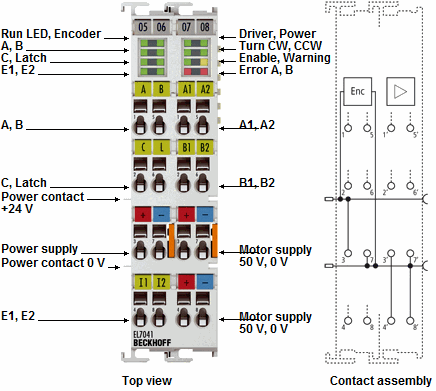 Together with two inputs for limit switches, they are located in the EtherCAT Terminal. The EL7041 can be adjusted to the motor and the application by changing just a few parameters. 64-fold micro-stepping ensures particularly quiet and precise motor operation. Together with a Stepper Motor, the EL7041 represents an inexpensive small servo axis. The EL7041 Stepper Motor terminal can be adjusted to the motor used by changing just a few parameters.